Designed for operations requiring an extra smooth cut, such as solid wood pieces that will be glued together. 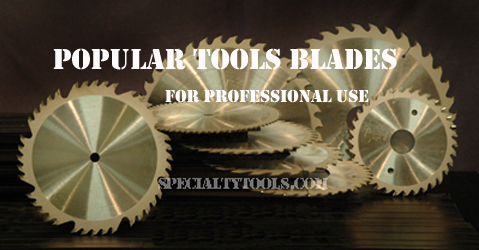 Use these blades for rip cuts only. Glue Joint Rip Saws can be bored out to fit most gang rip saws. Please call for more information and price on this service. TCG - Triple Chip Grind. Alternating triple-edge and flat top for dual action cutting. Triple-edge teeth chip down the center of the kerf, flat top raker teeth follow to clean out the material from both sides, extremly resistant to wear and fracture when cutting hard or abrasive material. LRLRS - Left Right Left Right Straight. Similar to LR, with added straight raker every 5th tooth. This helps to remove sawdust from the cut, giving better blade cooling and preventing dust buildup in the sawblade. An excellent design for mitre box and sharp trimming of slightly thicker wood than with the LR design. ATB Alternate Top Bevel. This is the most popular, saw design, and with good reason. It is excellent for cutting operations with or against the grain, acheiving a high level of quality over a high range of cuts. Top beveled sever the material with a shearing action. Teeth alternate left and right top bevel.